Barley is a grain that has a wheat like appearance and is nutty in taste with a texture like that of pasta. It is used in stews and soups and also for making beer. Barley is rich in amino acids, carbohydrates and dietary fats. Barley by itself cannot be consumed without removing the outer fibrous hull. Dehulled barley is used to make barley water and soup. Its flour is used in a variety of food preparations. Though the husk is removed, barley still has the germ or the bran, making it rich in Vitamin B complex, iron, calcium, potassium and zinc, making it a popular health food. Let’s see what the benefits of Barley are. 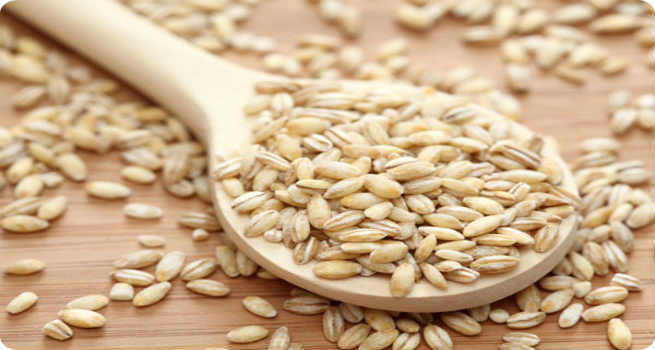 Barley is rich in selenium which helps in improving the elasticity of the skin and keeps it toned. Barley is also anti-inflammatory in nature. Therefore, applying it on the skin helps control the effects of acne and skin infection. Being a rich source of zinc, it also helps in healing any wounds or repairing the skin. Not just this, the bran in the barley helps in gently exfoliating the skin and controlling the oil that is produced by the skin. As a consequence, it also brightens the skin. So how can you use barley on your skin? As a cleanser- Make a powder of some barley in a food processor. Mix a tsp of the powder with some milk or water and wash your face with it everyday. It is effective in controlling acne and also in toning the skin. Barley Face Pack- Make a paste of barley flour with lemon juice and apply this paste on the skin. Leave it to dry before washing it off. The face pack, when used regularly, regulates the sebum production in the skin. It also helps in lightening the skin tone. Barley water for skin- Drinking barley water and topically applying it on acne regularly helps in putting an end to acne. The azelaic acid in barley controls inflammation and clogged pores and naturally treats acne. Barley is rich in iron and Vitamin B complex, both of which are essential to prevent hair loss and promote hair growth. Niacin and Procyanidin, both of which stimulate hair growth, have been isolated in Barley. When consumed these nutrients give your body enough minerals for hair growth. Since barley can irritate hair follicles, it is always advisable not to apply it on the hair. You get two kinds of Barley for consumption- Hulled and Pearl. The hulled Barley has the husk removed but endosperm intact- it is brown in color. The pearl barley is pearly white and does not have the bran or the endosperm. Both of them need to be cooked by simmering in water. Hulled barley takes longer than pearl barley to cook. They double in size upon cooking. Lets see what the health benefits of barley are. Promotes Digestion – Barley is rich in dietary fiber and helps in bowel movement. Regular use prevents hemorrhoids. It keeps the colon and the intestines healthy by pushing out waste and also by promoting the growth of healthy bacteria in the intestines. Improves Bone Health – Being rich in calcium, copper and phosphorous, barley is an ideal remedy for weak bones. Barley water contains more than double the amount of calcium contained in the same quantity of milk. Controls cholesterol- Barley bran contains propionic acid which keeps cholesterol at bay. Its dietary fiber is recommended for people with cholesterol since it is a zero calorie food. To manage diabetes- Barley regulates the blood sugar levels for many hours after its consumption because it has beta-glucan soluble fiber which slows down the absorption of glucose in the body. This way, you won’t see any spike in your sugar levels when you consume barley. So what’s stopping you from adding barley to your diet? Go ahead and make it a part of your meal and say hello to a healthier life.